Great news teachers! 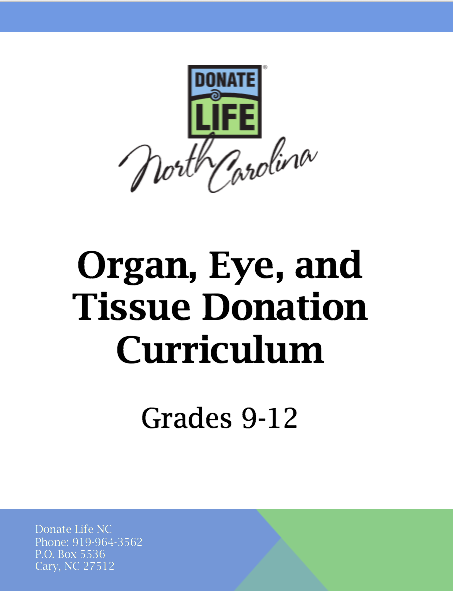 Donate Life NC now has new curriculum and classroom materials available for distribution. Created for high school students and young adults, these resources help students understand the importance of organ, eye and tissue donation and are appropriate for health classes and for drivers’ education classes anywhere in North Carolina. The new curriculum includeds four lesson plans, a reading list and a resource guide for parents and is available for free for any teacher or drivers’ education instructor in North Carolina. These new materials can be combined with formerly available resources including handouts, posters and videos. For more information or to receive the digital lesson plan files via email or flash drive, please email Tiffianna at Donate Life NC at telmore@donatelifenc.org.